Chief Yowlachie was a powerful, resolute-looking man; handsome with high cheekbones and copper complexion; firm of frame and tall-seeming, if not actually tall. With presence alone he invested his eponymous character in Sitting Bull at the Spirit Lake Massacre with the gravity needed to be a believable spiritual and political leader in a time of war. 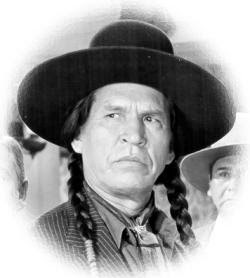 And with his acting, he made Sitting Bull a crook. That he could be both, and still a bit sympathetic, makes Spirit Lake Massacre a more interesting film than it’s actually trying to be. This Sitting Bull has a propaganda problem. His people have been robbed of their land and he believes they can get it back, if sufficiently motivated… But years of defeats have demoralized them and so, he needs a sign that will unify lesser chiefs beneath his banner and allow him to launch an attack on the nearby white settlement of Spirit Lake. Why this would accomplish anything beyond looting and a few murders—why, ultimately, it would be worth the inevitable, brutal retaliation the U.S. Army would level against him—is never explained, but it’s certainly important to Sitting Bull. So much that he’s prepared to trick his people into following through. 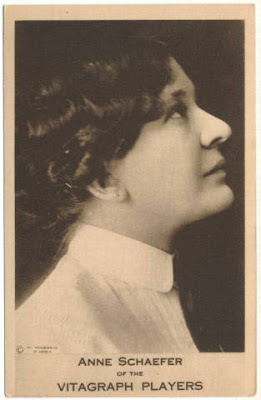 Key to Sitting Bull’s plan is Mame Mulcain (Ann Schaefer), known to Sioux as the ‘White Witch’ for her ability to divine the will of the Great Spirit through playing cards. For the right price, she’ll divine good news. The Iowan lives with her two lunkhead brothers just outside Spirit Lake, which is still too close for her fellow settlers, one of whom, in an early scene, calls her ‘white trash.’ She replies by lashing him with a bullwhip. The Mulcains are whiskey traders, killing the Sioux from the inside out, day by day. And Mame, their unbendable leader, values nothing but profit. But she and Sitting Bull are one in their desire to obliterate Spirit Lake, a place Mame hates as much for its classism as Sitting Bull does for its existence. Between Sitting Bull’s numbers and Mame’s prophetic authority, Spirit Lake is in serious trouble. Its only defense is the courageous Donald Keefe and his younger brother, Bob. Donald Keefe (Bryant Washburn) is one of those closed-shaved, fringe-wearing film frontiersmen who looks like he’s never spent a day on the range. Yet we know he’ll be the chief combatant against Mulcain and the Sioux, not because he displays any extraordinary skills, but because he isn’t elderly, drunken, female, or a man of the cloth. His brother, played by Bob Steele, exists only because Donald cannot be in two places at once. And having met the Keefes, we must instantly meet their opposite numbers, the Moore sisters, Celia and Mary. They’ll be paired off with the Keefes, asap—it’s so obvious that one onlooker warns the reverend about a double-wedding to come. The ladies are soon kidnapped by the Sioux. When bogged down with Keefes and Moores, Spirit Lake Massacre is no more than light romance followed by a kidnapping drama. Only when Sitting Bull and Mame are onscreen does the film’s real potential—as both morality play and character study—unfurl. I enjoyed watching Yowlachie, a Native-American actor and one-time opera singer, make subtle turns from the stereotypically stoic poses his Sitting Bull is forced to strike, showing corruption with every little smirk and quiver that cracks through that rigid façade. They’d be emblematic of Sitting Bull’s character even if the script weren’t there to explain it all. Schaefer, too, delivers a memorable performance. Her ruthless trader would be an anti-hero today, and she’s easier to respect than the Moore sisters, who are simply transferred from house to teepee to house by paternalistic men, waiting to be rescued. Schaefer’s ugliness, which is not the product of silent-era makeup, adds to her package. She’s a hard-bitten, bitter women unaccustomed to breaks, and unwilling to wait for any. Spirit Lake Massacre provides us two compelling, nuanced villains, but it remains so fixated on the white mens’ story that it squanders them. Two examples stick out in my mind: the first, a scene midway through the film, where Donald Keefe ‘interrogates’ Sitting Bull from atop his horse. Keefe is mounted, Sitting Bull is on-foot; the camera gives us only Yowlachie’s head in the bottom right, but all of Washburn, who sits tall and even bumps Yowlachie with his horse’s hindquarters. Remember that Keefe is nobody here—not even a sheriff—yet we’re to believe he can just sidle up to the most powerful Indian in Iowa and push him around like a beat cop with a mugger? And then there’s the ending. 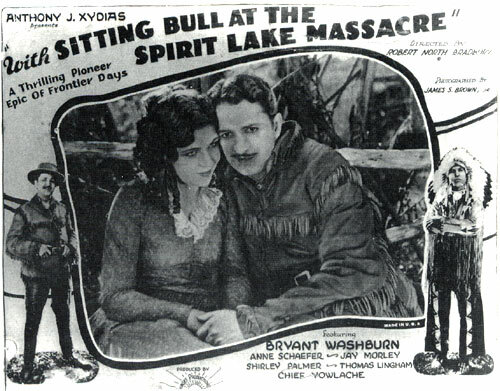 Not Yowlachie’s last scene, where a defeated Sitting Bull is shown defeathered and incarcerated—not that bit of potential intrigue. No, I mean the very last scene: the Keefe-Moore ‘double wedding,’ prophesied early in the picture and now come to pass. What an astonishingly banal conclusion, given the enormity of the events depicted beforehand. What an underestimation of the film’s audience, one that surely must have been more interested in Sitting Bull than some silly pastoral finish. At its best, Sitting Bull at the Spirit Lake Massacre is about the compromises people will make when they hate their lives too much to go on. Donald Keefe, though, would have no clue about that. He loves his little life, and his settlement full of podunk rubes, and indeed, for him it is a little slice of perfection. And that is what makes him so goddamned dull.